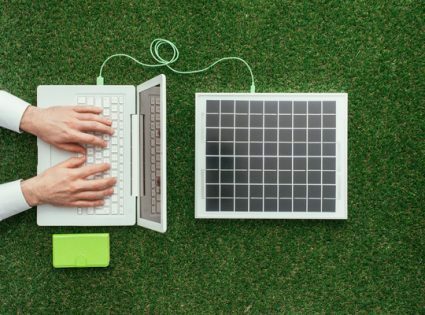 Why on Earth would anyone want a solar-powered MacBook? Well, for most people, they either want to work in remote areas, throw parties ‘off the grid’, or pursue something creative in the wilderness. For Lauren’s next expedition, the Gobi 2011, she falls into all of these categories. Although she’ll have sporadic access to satellite Internet, she won’t have access to AC power. Since I find solar power pretty fascinating, this makes a great excuse to tinker with a new project: Solar Power for Lauren’s MacBook. The energy that comes out of a home wall socket is AC, not only because it’s produced by motive power (e.g. a generator at a coal-fired power station), but because AC can be distributed to homes more efficiently. Your MacBook needs DC to charge its battery and run its circuitry. So your standard MacBook charger converts AC from the wall, into DC for the MacBook. Alternating Current (AC) is typically produced by motive force, such as that from a generator. As a coil spins between magnets of opposite polarity, electrons are sent in one direction, then the other. The constant reversal of direction, which causes a waveform, is why it’s called ‘alternating’ current. Direct Current (DC) is typically produced by non-motive force, such as that from batteries or solar panels. The chemicals or light provide a unidirectional, non-alternating, source of energy. Thus, there is no waveform produced and why it’s called ‘direct’ current. Have you ever felt your AC wall charger after using your laptop for a while? It’s often warm because the process to convert AC to DC produces heat, which means it isn’t very efficient. Remember I said solar panels produce DC power? Well, that means, if we want to use our standard AC charger, we’d have to convert the DC from the solar panel to AC for the standard wall charger. That can be achieved with an ‘inverter’, but again, the conversion process is inefficient. And since we want to carry the smallest solar panel possible, inefficiency isn’t our friend. So we need to ditch all AC components to make our solar-powered rig very efficient. Power (watts) is analogous to the force created by the total volume of moving water; this is a tricky one to visualize, but imagine the water pipe pointed at a spinning waterwheel. Power is analogous to how fast the waterwheel will spin. Applying this to the water pipe: the speed of the water wheel equals the water pressure multiplied by the volume of moving water. This is from my 13 inch MacBook Pro (best laptop ever, by the way). Guess what’s written on the other side of the charger (see below). Yes, 60W, which is close to our 60.225W from the calculation above. Now we know what the MacBook wants, so we can configure a solar power system to suit. Is There Any Leeway with Volts and Current? From first-hand experience, the answer is yes. I can plug a 14.5V charger from an 11 inch MacBook Air into my 13 inch MacBook Pro, which has a 16.5V input requirement, and it works just fine. It doesn’t charge as quickly, but it does work. However, in the quest for efficiency (and not ruining my MacBook), we’ll aim for the suggested voltage. The suggested current of 3.65A will charge the MacBook as fast as the specs suggest. You can certainly supply less current, but it will take longer. But there’s a limit to how low you can go. If you provide too little current, the internal circuitry won’t trigger the charge, and so you’ll get nothing. What’s the minimum current? I have no idea; we’d need a regulated power source to test that. But not to worry as we’ll aim to provide the suggested amount of current anyway. We need to supply about 16.5V to the MacBook and enough current to keep it charging. In the case of the Gobi 2011 expedition, Lauren will probably use up a fully charged MacBook battery over 3 days (a couple of hours per night). That means we need our solar power rig to provide enough power to charge the MacBook battery every 3 days. At a minimum, we need solar cells to convert the sun’s energy into usable power. We also need the cables and circuitry to connect the solar cells (or solar panel) to our MacBook. Let’s look at all of the required equipment, starting from the MacBook, and working our way back to the solar cells. UPDATE: See Doug’s comment in the comments section at the bottom. There’s also a way to achieve this without a secondary battery using a capacitor and resistor. Our standard charger requires AC power. But we want to remove all AC components for greater efficiency. That means we need a DC MacBook charger. This presents a problem due to the proprietary MacBook power connector. Apple MacBooks use Apple’s own patented MagSafe connector. It’s a magnetic connector designed to easily pull-out in case someone trips over the cord. Being patented, other companies cannot manufacture the MagSafe adapter without permission. And as far as we know, no one has permission. Apple’s Airline Adapter is not usable because it contains circuitry to only power the laptop, not charge it. And it doesn’t even work in a car, only on commercial airlines that supply enough voltage to the adapter. Now you see why we have to get tricky. There are some DC adapters with a replica MagSafe connector for sale on eBay. If you don’t care for the patent protection on this product, then go for it. Otherwise, you need to cut the MagSafe connector off the official charger and splice it with a generic DC charger (there’s a guy on the web, aptly named MikeGyver, who does this for you – more on him later). Most DC chargers have a cigarette lighter plug on one end, which is pretty universal for the rest of the components we need. The official Apple Airline Adapter requires about 15V, whereas most other DC adapters require 12V to work properly with the average car. This becomes important for the next section: choosing a secondary battery. This is something I struggled with for a while: why do we need a secondary battery if the MacBook already has a battery within it? Well, this is the best I’ve come up with. will provide constant and stable power to your MacBook, potentially increasing its life. doesn’t have the same protective circuitry that may disrupt charging as the solar panel moves between sun, clouds, and shade; the MacBook circuitry can be quite fickle in this respect. can more easily charge other devices, such as cameras, Kindles, phones, etc. is easy to move around with the solar panel, and less likely to be damaged by movement. Our DC MacBook charger will connect straight to the secondary battery for power and charge. We can use the solar panel to charge the secondary battery during the day and use the secondary battery to charge the MacBook at any time. A battery stores energy. It not only needs to provide the right voltage and current, but it needs to store enough energy to power the MacBook long enough. It’s no good providing 16.5V and 3.65A for only 10 seconds; we need it to last many hours. We know that our 60W AC adapter charges our MacBook battery in about an hour. That means the battery holds approximately 60 watt-hours of energy. A watt-hour (Wh) is another measurement of energy. Going back to our water analogy, a Wh is analogous to the volume of water passing through the pipe in one hour. A barrel at the end of the pipe may hold 60 liters after one hour of pumping, the same way our MacBook battery holds 60Wh after an hour of charging. When looking for a secondary battery, we need to keep this 60Wh figure in mind. If we want the battery to hold enough energy to fully charge our MacBook, we need a battery that holds at least 60Wh. Personally, I’d like a battery to hold more because if we get an opportunity with lots of suns, I want to charge up for a few days. We also need to be aware of the voltage of the battery. The official Apple Airline Adapter requires 15V, so in that case, we would need a battery that outputs a similar voltage. Most generic DC chargers require 12V, and 12V batteries are much more common. Let’s look at a few options from eBay. Imagine hauling around a 1.4Kg lead-acid battery in your backpack. So even though the lithium battery is more than triple the price, I’d pay the $32 to save more than 1Kg of weight. Lead-acid batteries may last longer, but their weight is just too much for this application. Rather than this bare-bones lithium-ion battery, I can also buy a variable voltage lithium-ion battery from a few specialty companies. That means I can hook it up to any device (iPod, Kindle, camera, etc. ), flick a switch, and give it the right voltage. This is a very important consideration, so if you plan to charge more than a MacBook, it’s the best way to go. Some flexible solar panels are just a series of smaller rigid panels wired together; they fold up between the edges of the rigid panels. They’re a good compromise between truly rigid and truly flexible solar panels. The cheapest, lightest and most efficient solar panel option is to buy a series of thin-rigid panels and wire them together. Why? Because rigid panels are more efficient and so your total package could be smaller, lighter and much cheaper. But this requires some serious electronics experience, which I certainly don’t have. There’s a pre-packaged option though…. woo hoo!!! I’ll talk about it in the next section. To run our MacBook without any batteries, I suspect we’d need to supply at least 40W to keep the internal circuitry happy. But we need to account for shade and changing sun angles, which means we’d need at least 60W. A flexible solar panel that outputs 60W costs a lot; probably upwards of $1000. And even 60W of rigid panels would be too big. But luckily, we have our batteries, which can store power throughout the day. And because we don’t need a full day’s worth of energy every day, we can trickle charge the batteries slowly with a smaller solar panel. Let’s look at the numbers from our previous assumptions. Since we’re talking about the Gobi Desert, we can assume that we’ll get a good dose of sun each day. On average, you get about 5 peak-sun hours per day in a sunny location. Even though we get many more hours of sunlight per day, that ‘peak’ figure accounts for the start and end of the day when the sun is less intense. So if we need 27Wh per day, and we have 5 peak-sun hours, we need about 5.3W per hour (27/5). So with just that data, and on a perfectly sunny day where our panel is perfectly angled to receive full sunlight, we would need a solar panel that supplies 5.3W. However, in an imperfect world, our solar panel won’t be at the perfect angle for the entire day and the sun will sometimes be blocked by clouds. Just small changes in cloud cover result in large output variations. And although our secondary battery isn’t hindered by tricky protective circuitry (unlike our MacBook battery, which would cut off charging if the voltage or current dropped below a threshold), it will still take longer to charge the battery with less than direct sunlight. So, at a minimum, we need to double that requirement (at least 10W). If you’ve made it this far, you’ve done well. And you may even be a little frustrated when I tell you that you can buy all of this stuff without having to worry too much about the science, but it will cost a lot more. There are two manufacturers in particular that I’ll cover, Brunton and Powertraveller. Brunton makes most of the components we need, but for a steep price. There’s also another guy on the web who makes a patent-friendly DC charger for MacBooks. He cuts the end off the official AC adapter to adhere to Apple’s patent. But again, the modified DC charger isn’t cheap. Powertraveller makes proprietary solar-power gear for travelers, but they’re more reasonably priced than Brunton. Plus, remember when I said, ‘there’s a pre-packaged [rigid panel] option’, well, this is it. Also note, this option uses a patent-unfriendly MagSafe DC charger and a few other generic bits and pieces. Check out that huge battery! It’s not much heavier than the Brunton 6Ah battery, but it supplies a whopping 8.74Ah, which will power a MacBook for almost 2.5 full charges. Generic parts are your friends, that’s if you don’t mind tinkering and searching high and low for suitable adapters. This option is only suited to powering a MacBook because the battery doesn’t have a variable voltage feature. You could shave some more money off this by building your own connected series of rigid panels. But this would take some previous experience. However, if weight is an issue, this could be the lightest option. But your gear wouldn’t be ruggedized like the Powertraveller products. Don’t overestimate the amount of sun you’ll receive; go for a bigger solar panel if possible. If you attempt a similar project, we’d love to hear your results. Similarly, if you have any questions, just shoot. If we don’t know the answer, we’ll defer to an expert. Oh, and lastly, if you are an expert and any of the above is incorrect, please let us know 🙂 Also, many thanks to Stewart from Barefoot Solar who imparted tonnes of solar-power wisdom during his stay with us in India. I’ll talk more about his super-cool company in a subsequent article.